Recently Trivantis, makers of the eLearning development program Lectora, announced the release of Snap! by Lectora. While the product isn't revolutionary and at times leaves more to be desired, with a $99 price tag, Snap deserves a closer look. So just what is Snap? Primarily it is a PowerPoint to Flash conversion tool with additional features for eLearning development such as narration recording, quiz assessments, and LMS publishing. Since Snap is a PowerPoint add-on, it exists inside PowerPoint as an additional option on the "Ribbon" menu. This allows users to easily convert new or existing PowerPoint presentations into rapid eLearning courses. Far and away the biggest advantage to Snap by Lectora is the extremely low price of $99. This fact alone could make it a more feasible option for many. The ability to natively record slide-by-slide video annotations is a great feature of Snap. There is also a similar audio recording option plus the ability to import and make basic edits to existing audio and video files. In addition, Snap allows you to sync your media up to the timing of PowerPoint animation effects. Every presentation created with Snap can be exported to a Lectora Project file (.awt). This includes any quizzes and surveys created in Snap, which some may find easier to work with than Lectora's traditional question creation wizard. Just be aware this is a one-way process. Quizzes and surveys created in Lectora cannot be exported to Snap. Inserting additional objects into PowerPoint has always been a pain. With Snap it's easy to embed web pages, YouTube videos, and Flash objects. While there are similar options in Articulate, the process is easier with Snap since it's right there on the ribbon. Unlike Articulate, there is no simple interface for creating branching navigation. Snap is clearly intended for start-to-finish linear navigation. With the recent rise in mLearning training content for mobile devices and tablets and Apple's refusal to support Flash, publishing to Flash has its drawbacks. In short, Snap-published content won't run on the iPhone or iPad. At times Snap can feel like it’s still in beta development, but hopefully that will begin to change as newer versions are released and minor kinks are worked out. Whatever downsides Snap currently has, the low price tag more than makes up for, and it's definitely worth downloading the 30-day trial to try it out. What are your impressions of Snap? Have you put it to good use yet? Update 8/7/2011: Trivantis has released a patch for Snap! (v1.1) that has added some additional functionality including branching. Good review, but I believe you are incorrect on two fronts. 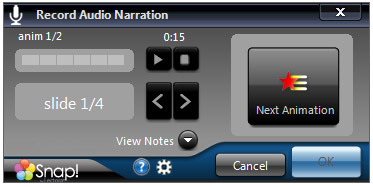 First, the narration capabilities are nearly identical to Adobe Presenter. I am less familiar with Articulate - so I can't comment there. Second, branch away using PPT hyperlinks and then turn off the player controls. So no, a published Snap! files does not need to be linear. Great review, Joseph! I see one advantage of Snap that I intend to use. Because output is a single file .swf (as opposed to a multiple file output by Articulate), it is easy to use Snap to create a quick swf animation to use elsewhere. For example, you can use PowerPoint animations to create a snazzy opening graphic to then put in a Lectora course -- or any other formats. And since you can make the page size whatever you want, you can even use Snap for an animated banner at the top of a web page. @James - Thanks for the comment. You're correct about Adobe presenter's narration capabilities being similar. It's Articulate doesn't currently allow native video narration. Branching with PowerPoint links is possible, but like you mentioned, that's only with the player/skin disabled which isn't always ideal. It would be nice if branching was a more of a feature than a work-around. @Diane - Great ideas for using Snap's single SWF publishing! There's also no reason why a Snap published SWF couldn't be inserted as content into an eLearning course built with another development tool. It will be interesting to see what other uses people discover for Snap over time. I'm seeing an issue with the Survey. When you create the survey and try to send the results to Coursemill, they never show up in the Interactions report. Additionally, only the quiz score (primarily the AICC Score) appears, but not the individual answers to the questions when uploading to Coursemill. Trivantis has acknowledged this bug and they are working with the developers to rectify the situation. I've built a PPT that uses hyperlinks for branching and navigation, but even when I publish it using the no controls option, I find the final output doesn't allow me to use the hyperlinks to navigate and branch. Any help? I have been unable to find a complete list of features for Snap. I am particularly interested in finding out if the player supports a search capability similar to what Adobe Presenter has. Anyone out there know if Snap has that feature? @Sean v1.1 has added branching navigation to the player controls that may help you out. I encountered an issue where shapes would not retain their hyperlink when publishing with Snap. I got around this by overlaying text on top of shapes. @Tony Snap does not currently have any built in search capability. I recommend downloading the demo to see first hand what other features Snap may or may not have. I am wondering if "Snap" is compatable with a linux operating environment? I doubt Snap would work on Linux since it's a PowerPoint plug-in, but you can contact support@trivantis.com to find out for certain. I am trying to save quiz result to server. i have set the server URL to "http://localhost:63596/Home/SubmitQuiz". It posts the result to the url properly but displaying the error message "There were errors encountered submitting your snap quiz results". I am using MVC and i am returning "return new HttpStatusCodeResult(System.Net.HttpStatusCode.OK);" at the end of the action. What's the wrong i am doing. Please help. Project Teams – Coordinating or Collaborating?